SLED Security training as well as Taser and OC Pepper Spray training. We offer it all. Each link will explain what is achieved by taking the class. This is where you go to get your training to become a SLED Certified officer. The 2 classes offered in here are the “Primary Basic” and the “Primary Plus“. Primary Basic is the minimum requirement. You must at least have this class to be a SLED Certified officer. We only train this class to work in SC. You can live in another state and get your SLED certification to work in SC. This is where you go to get OC Certified to carry “pepper spray”. You must have had the “Primary Basic” class 1st. 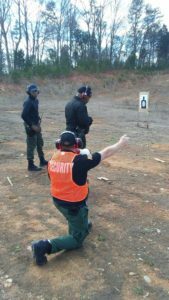 Training for SC and If your from another state other than SC, you must be a Certified Security officer. This is where you go to get Conducted Electrical Weapons (CEW) Training, also known as Taser even though “taser” is a brand name. You must have had the “Primary Basic” class 1st. 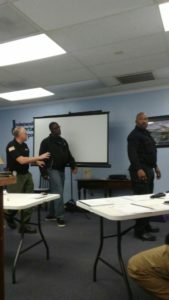 Training for SC and If your from another state other than SC, you must be a Certified Security officer. This is where you go if you want to become an “Armed” officer. The Primary Plus course is part of this training but to get certified to carry a semi auto or revolver…you must have had the “Primary Basic” class 1st. We only train this class to work in SC. You can live in another state and get your SLED certification to work in SC. Learn to carry a Concealed Weapon in our CWP Class for civilians. We only train in SC.